Tian at ITC Maurya Sheraton, New Delhi has been eluding me for a while. Why Tian? That is where Chef Vikramjit Roy moved a couple of years back. During his few years here when he set up Pan Asian, it turned out to be a restaurant that served the whose who of Chennai. He developed a fan following! 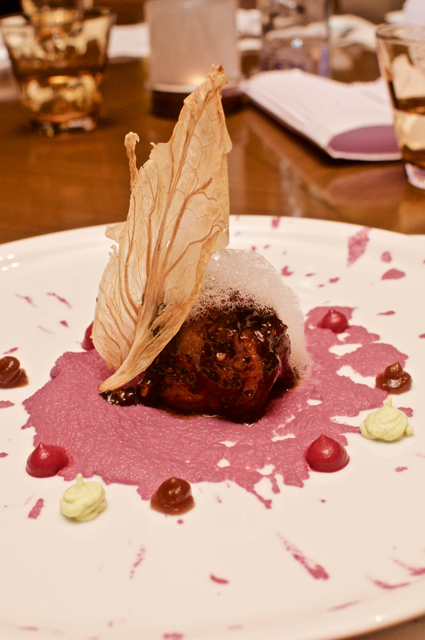 As a food writer, I was still getting my grip on writing about fine dining when I first met Vikram. As I've been more exposed to fine dining over the years, he has taken his food a couple of notches above. Over the years, we've connected over food. And that connection refuses to break, touch wood! So when Vikram comes to Chennai, he is usually here on request to host something really big. And while he is here, he takes reservations from his fans and cooks up a storm. He was gracious enough to host us yesterday and a storm it was indeed. 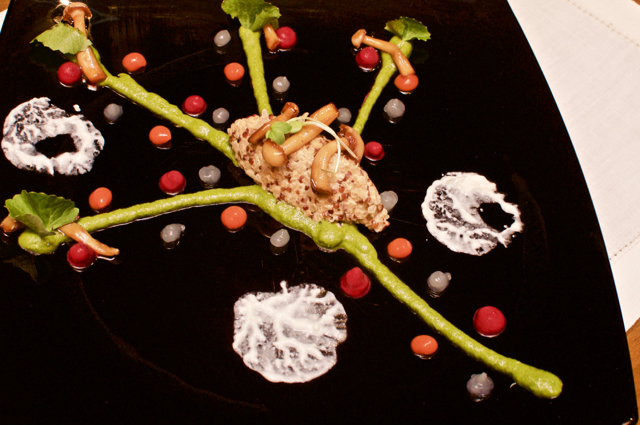 You hear people serve art on the food. You hear of chefs tell a story through food. But not Vikram. He has to take it further! Dinner was the story of a Drop told via different art form via food! Since I am struggling to find words, I'll stick to trying my best to describe the dish. It all started with a drop. A drop of lychee, but a transparent lychee as the amuse-bouche. Smoky. On top of a beetal leaf. The leaf to smell and the lychee to eat. Something amiss. 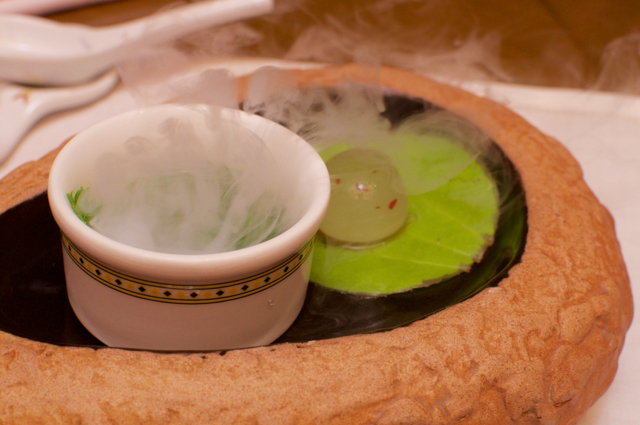 Till you realise that the lychee has been juiced and then reformed into a sphere that makes it transparent! Genius. Soup followed. 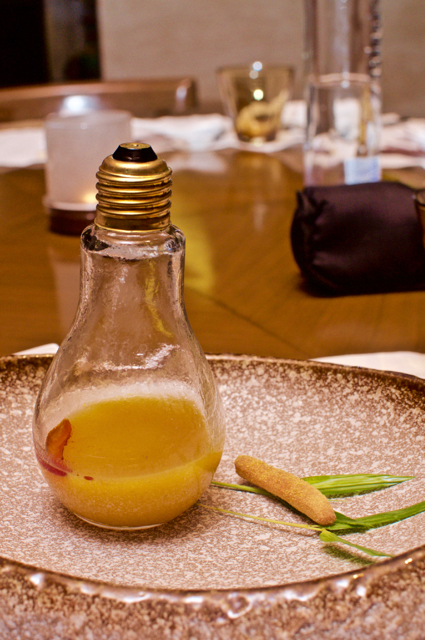 A pumpkin soup served inside a bulb. Pumpkin soup always bring about the familiarity of that sweetness, but not here. With truffle pate and chilli oil, this was spicy and the small piece of bun to bite added some texture. Salad course! A quinoa salad with mushrooms and pesto sauce with loads of micro veggies treated with liquid nitrogen or oxygen or malto-whatever! Stopped thinking after the last dinner here. Just mix everything together and enjoy! The drop (remember the story?) now lands on concrete and splatters. This was represented by a prawn beautifully cooked with a black bean sauce served on top of cabbage mash! When the drop lands on earth, it then spreads! 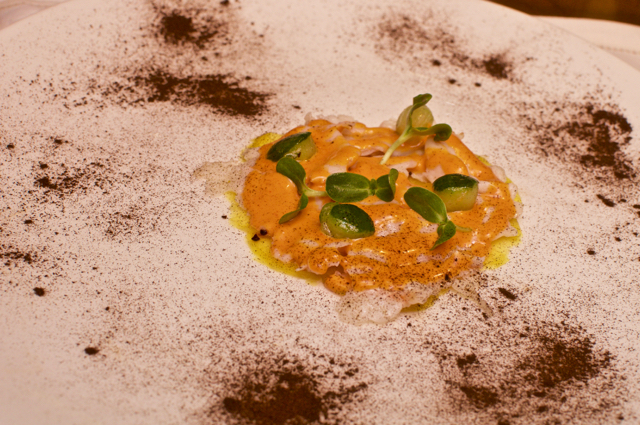 Represented by the lobster carpaccio with micro greens and with burnt leeks! The art form used to depict this was coded graffiti which apparently used during Hitler's time to send across messages. The drop moves towards the water and thanks to the story heading there, we get beautiful scallops on top of, hold your breath, herbed onion mash. I've had mashed potatoes and cabbage and beetroot, but onion? 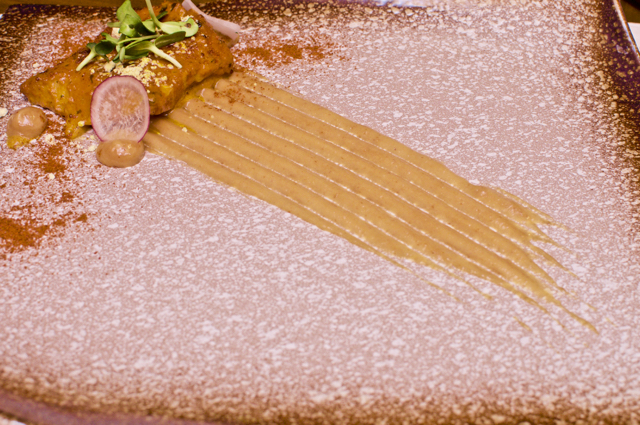 With the sand representing (literally) the crab, the sand itself was spicy. White and spicy? It was made with a Japanese fermented chilli paste and olives! A little too spicy and I wish I had something to wash it down. 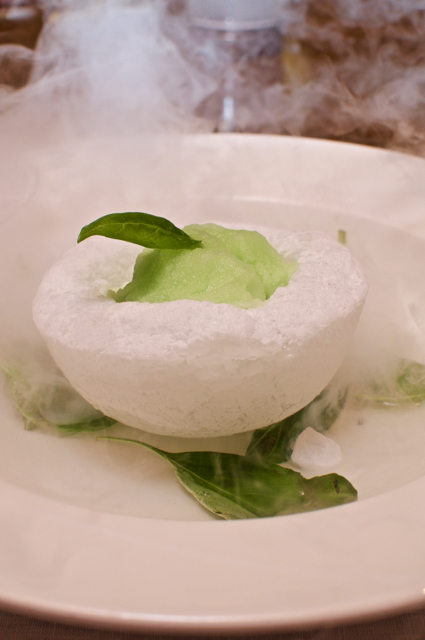 Obviously when a chef who plans a 10 course meal to this level of perfection surely knows it was spicy, so he follows it up with a fantastic basil sorbet! Cools down your tongue and cleanses the palette! Get set for main course. Ha ha. Indeed. Chilean sea bass! Yum, but nothing prepared us for the next course! Pulled lamb lasagne! Not with pasta sheets, but with potatoes! Or was it pumpkin? I don't remember because the lamb was simply melt-in-the-mouth! Oh, before you taste the lamb, a thai curry was poured on top and some jasmine rice served on the sides! I finished the lasagna before I emptied the curry with rice! And satiety then hit me. How perfect? 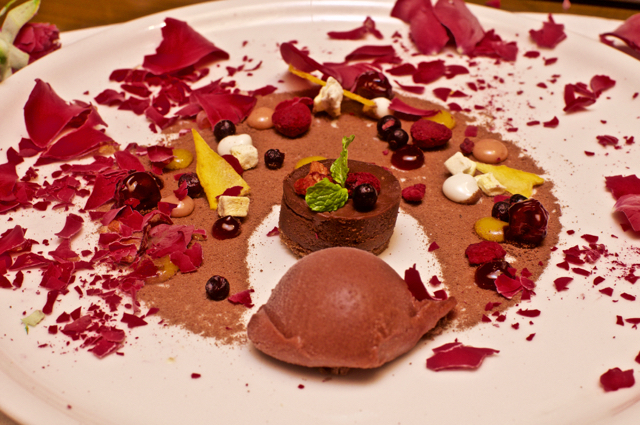 The 9th course is when you are full and you have just the space in the heart for dessert! 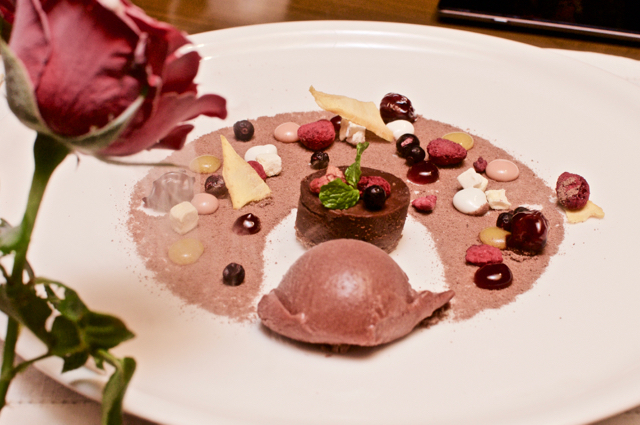 If the rest of the courses were exhilarating, dessert was exciting. Gives you a rose in hand and some art on the plate and he asks you to smash the rose on the plate. Before you realise what is going on, you end up following his instructions and the rose simply cracks open and smashes all over the plate! He gives you art and an art-tool and you complete the art! Every single course was well thought out, with so many elements in each dish that all seamlessly blended together to give you a perfect dish. 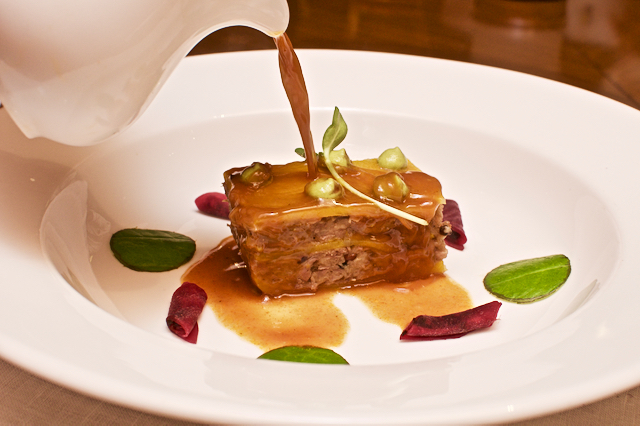 And every dish followed the previous dish seamlessly in flavour, depth and intensity to balance out the entire meal. 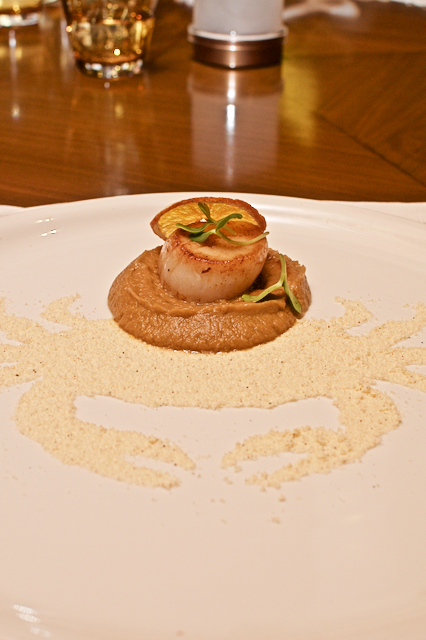 The meal beautifully showcased the artist in the chef and the story that he wanted to convey. Now I want to see what he does in his 'home' kitchen at Tian, ITC Maurya. Chef Vikram was in his second 'home', Pan Asian at ITC Grand Chola for a special event and took reservations for a limited number of guests during his stay here. The meal was priced at Rs. 2250+ for guests.